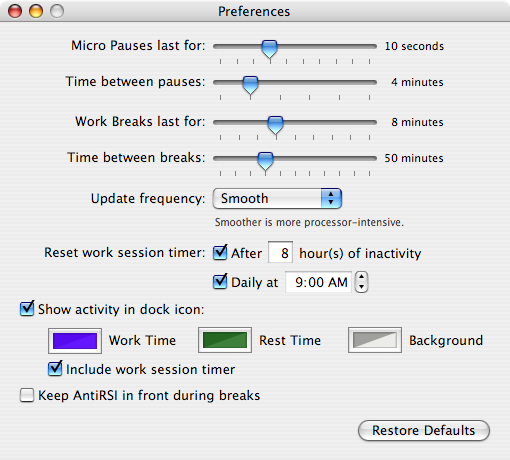 Onne Gorter’s AntiRSI is a Mac OS X application which reminds you to take periodic breaks from typing. Along with my beloved IBM model M15 keyboard, it’s essential to my getting any work done at all. However, AntiRSI had some problems. The animated progress bar displayed during breaks sucked CPU like crazy, causing problems if I was watching a video at the time. Breaks kept getting prematurely reset because AntiRSI thought I was typing when it was a program like VLC calling UpdateSystemActivity, trying to avoid triggering the screensaver. Finally, the break window was just plain ugly—look at those poorly antialiased corners. The last problem was more of a missing feature. While programming, I spend enough time thinking that I’m generally pain-free even if I work all day; unfortunately, debugging, writing and system administration can be much more typing-intensive, so I have to limit my daily typing time in aggregate, but AntiRSI didn’t keep track of it. Over the past few years I’ve fixed these issues, and since my previous emails offering patches have gone unanswered, thought the result might be useful to others: download AntiRSI 1.4njr2 if you’re interested. If you have a Mac and don’t like AntiRSI, try Time Out: it’s much more customizable, but takes over the entire screen, making it unusable for me. According to a VersionTracker review, it also hogs CPU during breaks. For Windows and X11, check out Workrave; it’s great, includes a session timer and even comes with network support if you use multiple computers.